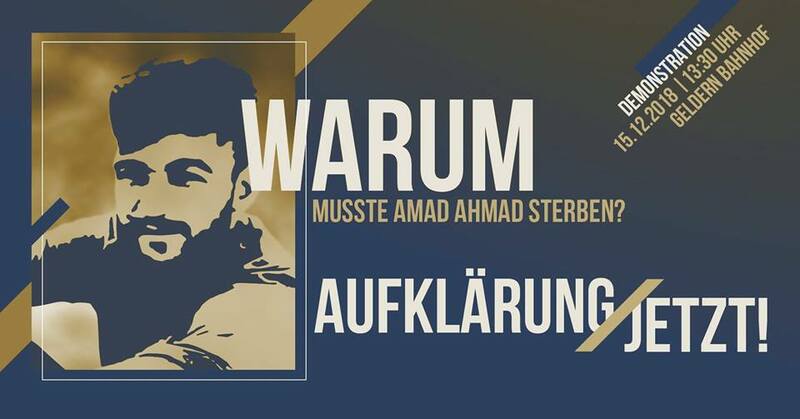 Home / Germany / #Geldern, German territory – Demonstration: Why did #AmadAhmad have to die? We demand clarification, now! #Geldern, German territory – Demonstration: Why did #AmadAhmad have to die? We demand clarification, now! German territory: More than two months after Amad’s death in prison in Kleve, we want to demonstrate in Geldern on Saturday December 15, 13.30 (01:30pm). We demand immediate clarification of the circumstances of his death. Originally published by Initiative Amad A. Facebook event page. Edited machine translation by Enough is Enough. We have many questions: to the Ministry of Justice, to the police and to the officials responsible for his death for unlawfully putting Amad in jail. We can hardly imagine that Amad was “mistaken” for somebody else. In recent years we have experienced the racism of the police in Geldern itself. How the police deal with refugees, migrants, but also with us – people born and raised in Germany who have lived here for many decades – is unacceptable. Amad also became a victim of this racism in this alleged “confusion” because the police apparently did not want to bother with a refugee to check personal details, photos, fingerprints, places of residence and origins. They already considered him to be a criminal anyway. We are angry, too, because Amad can not say anything anymore about the allegations made by, among others, the NRW state minister of interior minister Herbert Reul. Amad is dead but shortly after his death the interior minister had nothing better to do than to incite a number of suspicious cases. We ask ourselves: is the rule of law working? Is a suspicion case already a court decision? Since Amad’s death, we have many questions that remain unanswered until today. We will not accept this and with the demonstration we want to send a first signal that we demand full information immediately. Why did nobody believe Amad when he said he was not the one who was wanted (by police, EIE)? Why should Amad have said only once that he is not the one they are looking for? We knew him differently, he wasn’t like that. Why didn’t the police and the judiciary provide Amad with an interpreter even though he barely spoke German? Who turned off the intercom in the prison in Kleve when in Amad’s cell was buring for 15 minutes? Why didn’t anybody tell us he was in custody? Why is it asserted that Amad did not want his parents to know that he is in custody? Why did nobody tell us he was in the hospital? Why is it asserted that he committed suicide? Was he even suicidal? What would have happened to Amad’s body if his father would had not have heard from the media that he died? Why was an external fire expert consulted after more than two weeks after the fire and not shortly after his death? Why was Amad’s cell opened so often after the fire? Does Amad’s death have a similar racist background as the Oury Jalloh case in 2005 in Dessau ? We also wonder how it can be that the officers responsible for his unlawful detention continue to work as policemen in Geldern. Who protects us, who protects people from these policemen? We want to call all interested parties and all demo participants to appear in colorful clothes and leave any party flags, be it Kurdish or German, at home. It is about our friend Amad, to commemorate him and the clarification of the circumstances of his death. We will provide materials and slogans ourselves to give the demonstration a dignified frame. Banners that refer to racism and for example the Oury Jalloh case are welcome. We see many parallels here. We meet at 13:30 at the train station in Geldern (German territory).